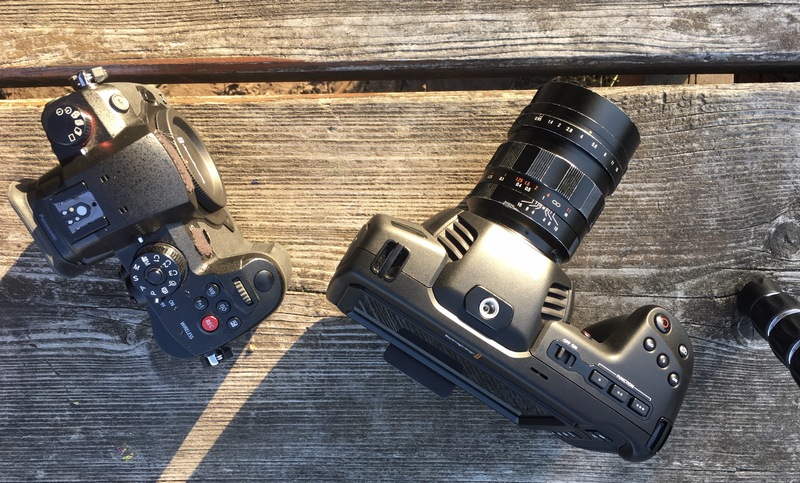 This is a first brief look at the Blackmagic Pocket Cinema Camera 4k on the day of its arrival. Last monday a really exited salesman from Hamburg gave me a call to tell me that I m lucky to be amongst the first 4 folks that actually will get the new Blackmagic Pocket Cinema Camera (BMPCC4K from now on) this very week while the rest of the line of preorderers will have to wait a few weeks for their new cameras. So, here it is, and rather than filming an unboxing, I directly went out and wanted to test it right against the Panasonic Gh5s in terms of dynamic range. Both cameras are supposed to share the same sensor, so the question is, if the 13 purposed stops make a difference in a real life test using the ProRes codec (as long as Blackmagic’s new Raw Codecs arrive this is the more practical way to shoot in therms of file sizes and easy workflow). I didn’t name the cameras in the first test to conduct a blinded experiment. The result was that may viewers were sure camera a(the GH5s) was the new pocket). Interesting enough. The method I used was to expose to the right in most cases (in some examples I fist slightly overexposed some shots and afterwards exposed to the right), and then in post set the blacks and the highlights to 0 and 100 ire. So this is not about the color science or the different log algorithms, instead just a simple test how much dynamic range can be captured. This was the first occasion to actually use the new BMPCC4K. I was expecting to get blown away looking at the footage. But this did not really happen just yet. At this point I must admit that I manly use the Panasonic GH Lineup in my day to day work. Sometimes there are shoots where RED is used. When it comes to private projects, my favorit image comes out of the older Blackmagic Pocket Cinema Camera. So my expectations regarding the BMPCC4K are high. – It doesn t produce an image to directly fall in love with, other than the Ursa Mini or the BMPCC. Looks more like another Panasonic GH camera with slightly new color science..
– This camera is bulky. It doesn t fit on my beloved Beholder DS1 gimbal. The weight would be ok, but the size and width is too big. – I used the camera for about 1 1/2 hours, and it went through two batteries. I d say its even worth than the BMPCC. Also, it abruptly turned off while recording without any alert beforehand. This was the original batterie. – nothing bad can be said about a camera so comparable to the Panasonic GH5s with additional RAW recording options, coming with a Resolve Studio Licence included at this price point. 4K60p glory was never cheaper and this is a hell of a professional tool! This might be the best actual tool for budget filmmaking on the market. – this new codec Blackmagic is talking about and wanting to integrate sounds like a revolution. The best of raw with file sizes smaller then most h264 compressions, in single files with quick handling. I will constantly update this article so please feel free to check back, thanks for reading.